Vintage Design Goethe Desk Lamp by Christian Dell for Bunte & Remmler. Vintage Design Goethe Desk Lamp by Christian Dell for Bunte & Remmler. Rare Goethe desk lamp designed by Christian Dell for Bunte & Remmler (Frankfurt) – 1930s. This Bauhaus desk lamp is considering its age in very good condition the iron (nickel) has some wear consistent with age and use. The lamp is restored (professionally sprayed black) and looks very beautiful again. 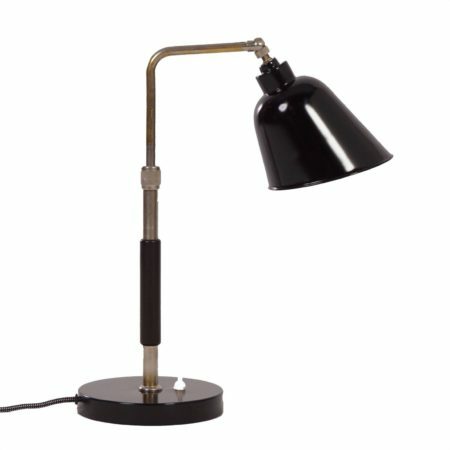 This Bauhaus lamp is fully adjustable / rotatable and has an extendable lamp tube. In the stand is a beautiful handle of Bakelite. Measurements: h x w x d = 47 x 40 x 18,5 cm.